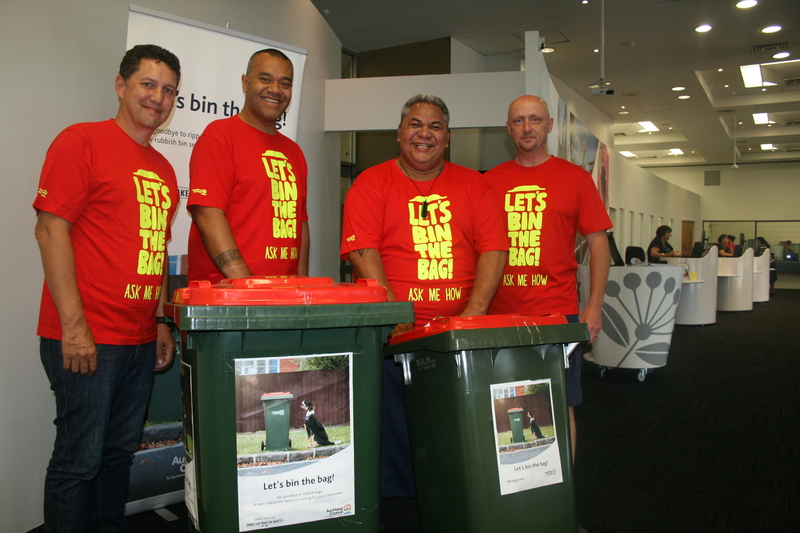 Waste solutions team leader James Young, Manukau ward councillors Fa'anānā Efeso Collins and Alf Filipaina, and waste solutions enforcement officer Stuart Airs. Howick and south Auckland – let's get ready to roll! Your new rubbish bin collection starts on Monday 4 September. You don’t need to buy rubbish bags. Rubbish can be placed directly in the bin. The last collection day for the old plastic rubbish bags is Friday 1 September. Your rubbish collection days stay the same. Put your bin on your kerb by 7am on your usual collection day. There is no extra charge for the standard 120-litre bin – your rubbish bin collection is paid for by your rates. For more handy tips to help use your new wheelie bin, visit Make the Most of Waste. Manukau Ward Councillors Alf Filipaina and Fa’anānā Efeso Collins are looking forward to the important environmental and safety benefits when we bin the bags in favour of the new wheelie bin collection service. “Rubbish bins are the better environmental choice, they keep our streets cleaner and safer for everyone,” says Councillor Filipaina. Councillor Collins says ditching rubbish bags will feel like a big change for some, but it is possible to fit an average family’s weekly rubbish into the standard bin if we reduce our waste. Use reusable plates and utensils at gatherings and wash them, instead of using plastic items and throwing them out. Did you know food waste makes up 40 per cent of our rubbish? This can be composted, putting the goodness back in your garden. Sign up for a free composting workshop at Compost Collective to learn more.